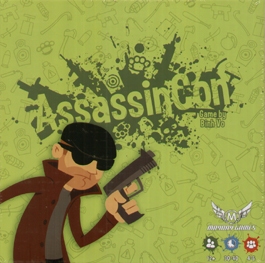 Welcome to AssassinCon, the one time each year when all the cloaks and daggers gather to atend seminars on practical invisibility and browse the latest in ninja hoods. But the real action is in the games, sneaking silently through the shadowed corridors. Pursue as you are pursued! Eliminate your opponents! In this game, skill and strategy mean the difference between success and a truly heinous headache. Good luck! And may the best Assassin win!